With an ever-increasing use of MRI, there’s essentially a 100% likelihood a person will need at least one, if not multiple, MRI scans in their lifetime. In fact, in just the United States, more than 100,000 MRI scans are performed every day. That means every cochlear implant will very likely end up inside the powerful magnetic field of a high-field MRI scanner. It might be a routine knee scan a few months after implantation, or an emergency spine MRI following a car accident years from now, but that day is coming. That’s what makes MRI safety such an essential consideration for every single cochlear implant recipient. 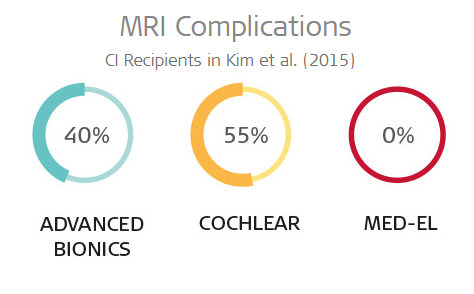 For more than 20 years, we have engineered our cochlear implants to offer exceptional MRI safety. Our cochlear implants enable immediate and reliable access to MRI scans for both recipients and clinicians. With MED-EL, your patients can have MRI where they need it, when they need it. And if you’re looking for our detailed MRI instructions, you can always find the full MRI conditions for all MED-EL implants at medel.com/isi. First, let’s look at the design of MRI machines. 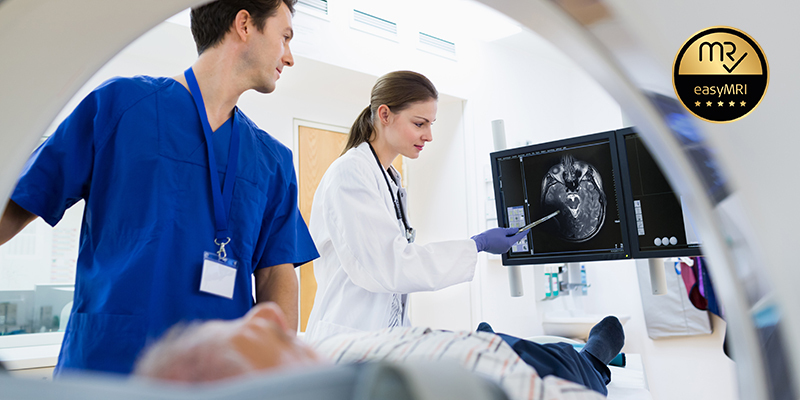 As the name implies, every magnetic resonance imaging scanner has very powerful magnets. These are static magnets, which means they’re usually always at full magnetic force. Those static magnets are incredibly strong—a 3.0 Tesla magnet is strong enough to lift a car. Right now, 1.5 Tesla is the most common field strength, but high-resolution 3.0 Tesla scanners are quickly gaining popularity and may already be the only option in a number of clinics. Now, let’s look at cochlear implants. Every cochlear implant has an internal magnet to hold the implant coil in place. With many implants, a simple axial magnet is used. 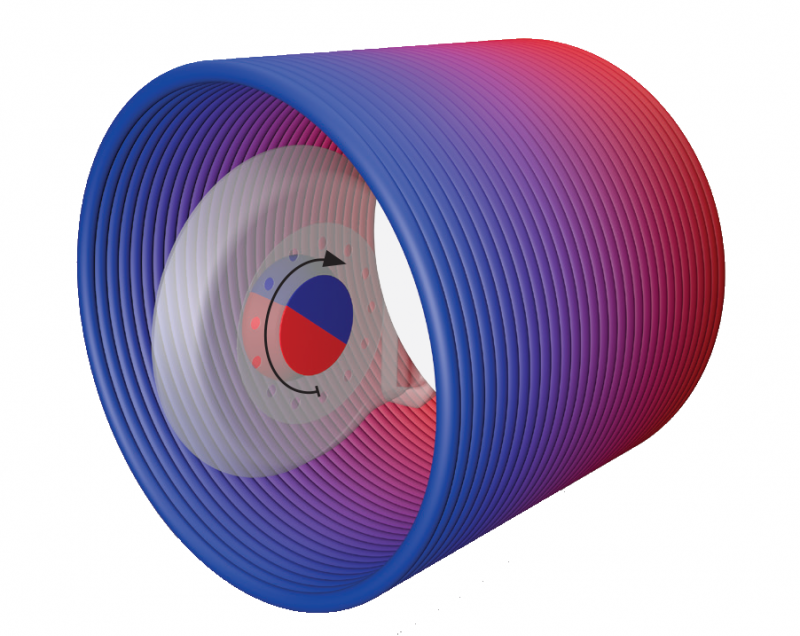 An axial magnet is like refrigerator magnet; north is one side, south is on the other side. Generally, the “head” end of a scanner is the main magnet’s north or south pole, with the opposite pole centered at the entrance of the scanner. An implant lies flat against the skull, so that axial implant magnet is oriented perpendicular to the main static magnetic field of the scanner. As a patient enters the scanner, the implant magnet will attempt to align to this powerful field, so this 90° offset can cause significant torque force that pulls on the magnet. 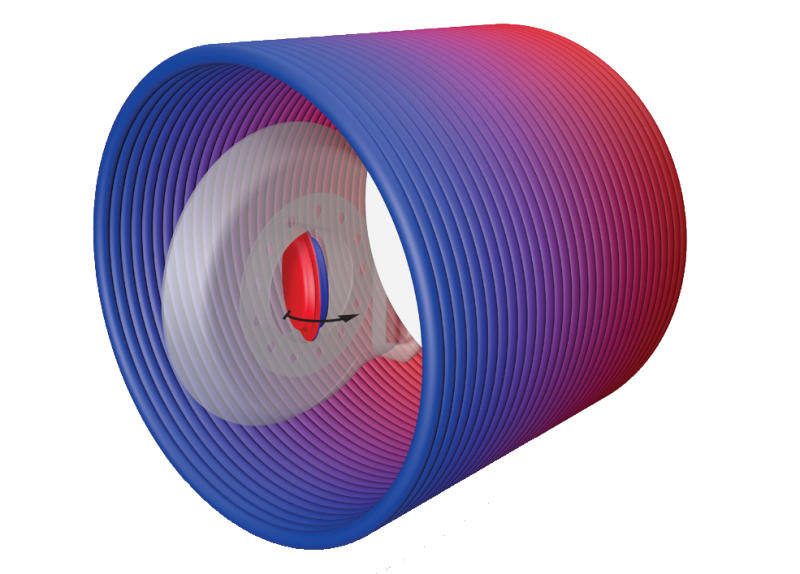 This powerful torque force is the main challenge for MRI scans with a cochlear implant. The rigid splint puts pressure against the skin above the magnet to resist the forces of dislocation. However, this doesn’t reduce the magnetic torque. The magnet can still attempt to align to the magnetic field. This can create highly concentrated pressure against the skin pinched between the rigid splint and magnet. If an axial magnet is not securely imbedded, it can be dislocated by the powerful magnetic field of the MRI scanner. Magnet dislocation can cause the magnet to tilt up to 90° on edge to align with the north-south field of the scanner. Your patients may not need an MRI every day, but would you trust a car seatbelt with a 30–55% failure rate? At MED-EL, we’ve always made safety and reliability our priority. We have always used secure implant magnets—making magnet dislocation practically impossible. Currently, we use three secure magnet designs for our portfolio of hearing implants. All three of these designs offer safe, reliable access to MRI without any risk of magnet dislocation. Let’s start with our cochlear implants. For more than 20 years, our cochlear implants have used an axial magnet that is securely imbedded in a stiffening ring inside the coil. Axial cochlear implant magnet securely imbedded in silicone with force-distributing stiffening ring. Inside of an MRI scanner, this design evenly distributes any magnetic torque across the full surface area of the implant coil, which avoids any painful focused pressure. A simple head bandage should be used to help minimize any movement. Our BONEBRIDGE Active Bone Conduction Implant and VIBRANT SOUNDBRIDGE Middle Ear Implant VORP 503 both use a secure, force-balanced magnet that enables comfortable 1.5 Tesla MRIs. Both of these implants are designed to avoid any torque-related movement in an MRI, so no head bandage is needed. And then we have the latest breakthrough in MRI safety: SYNCHRONY. SYNCHRONY’s diametric magnet can rotate and self-align inside of a secure titanium housing. Inside of an MRI scanner, SYNCHRONY’s magnet rotates to align with the main static magnetic field, so there’s practically no magnetic torque force. Looking forward, your patients will all need safe, reliable access to MRI scans. And they rely on you to help them make the best-informed decision they can. With MED-EL, you can help ensure they’ll have safety, comfort, and peace of mind for years to come. This simplicity offers more than convenience; it provides much greater safety and security for your patients and fellow clinicians, while ensuring immediate access to essential diagnostic imaging. With MED-EL, your patients can have MRI where they need it, when they need it. 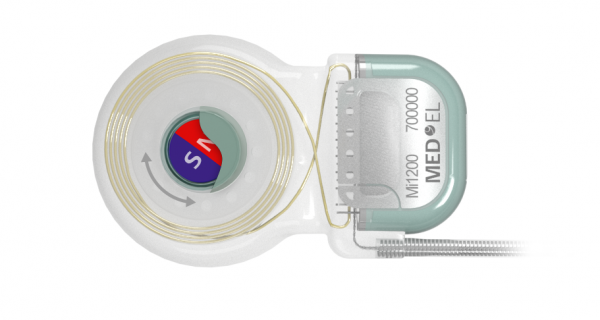 Looking for more information on MRI with MED-EL hearing implants? Check out our step-by-step MRI guides for cochlear implants and for SOUNDBRIDGE & BONEBRIDGE. Have a radiology question about MED-EL hearing implants? Contact your local MED-EL office or let us know with our simple contact form. 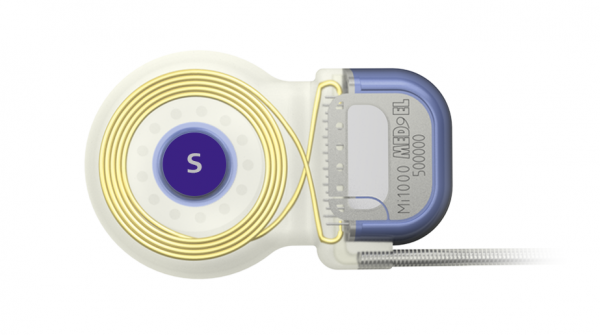 Want more in-depth articles on hearing implant technology? Subscribe now to get our latest articles right to your inbox! * Recipients with MED-EL cochlear implants may be safely MRI scanned when following the specific conditions for each implant detailed in the instructions for use. **Not all products, indications, and features shown are available in all areas. Please contact your local MED-EL representative for more information. Kim, B.G., Kim, J.W., Park, J.J., Kim, S.H., Kim, H.N., & Choi, J.Y. (2015). Adverse events and discomfort during magnetic resonance imaging in cochlear implant recipients. JAMA Otolaryngol Head Neck Surg. 141(1), 45–52. Carlson, M.L., Neff, B.A., Link, M.J., Lane, J.I., Watson, R.E., McGee, K.P., Bernstein, M.A., & Driscoll, C.L. (2015) Magnetic resonance imaging with cochlear implant magnet in place: safety and imaging quality. Otol Neurotol. 36(6):965–971. Young, N.M., Rojas, C., Deng, J., Burrowes, D., & Ryan, M. (2016) Magnetic resonance imaging of cochlear implant recipients. Otol Neurotol. 37(6):665–671. Gubbels, S., & McMenomey, S. (2006) Safety study of the Cochlear Nucleus 24 device with internal magnet in the 1.5 Tesla magnetic resonance imaging scanner. Laryngoscope. 116(6):865–871. Todt, I., Tittel, A., Ernst, A., Mittmann, P., Mutze, S. (2017) Pain free 3 T MRI scans in cochlear implantees. Otol Neurotol. 38(10) e401–e404. Wagner, F., Wimmer, W., Leidolt, L., Vischer, M., Weder, S., Wiest, R., Mantokoudis, G., & Caversaccio, M. (2015) Significant artifact reduction at 1.5T and 3T MRI by the use of a cochlear implant with removable magnet: an experimental human cadaver study. PLoS One. 10(7): e0132483. Helbig, S., Stoever, T., Burck, I., Kramer, S. (2017) Cranial MRI in a young child with cochlear implants after bilateral magnet removal. Int J Pediatr Otorhinolaryngol. 103:1-4.